An artificial intelligence system designed to help clear the best route for ambulances is set to have its first live trial in Oxford this year. Created by Liverpool startup Red Ninja, the system changes traffic lights along the ambulance's route based on a combination of real-time and historical traffic data. While amblance drivers can already run red lights and push button systems have been tested that enable them to change lights as they travel, the Red Ninja system uses a computer algorithm to predict the ambulance's route and clear a path without the driver being distracted by its presence. Red Ninja has spent the last few years analaysing location data from ambulances in Liverpool combined with network data such as the length and shape of a route and the amount of cars on it as well as levels of detail such as the length and height of kerbs. Using the GPS data it can pin point a vehicle's position within five second intervals. This system then links up with a city's traffic management system, through a handover process allowing the algorithm to control the lights to clear predicted routes to green. If the driver changes course the algorithm responds by clearing the most likely course along the new route. It currently works with Siemens' Split Cycle Offset Optimisation Technique (SCOOT) system and Dynniq's traffic management control systems, which control cycles of green lights in urban areas across the country. 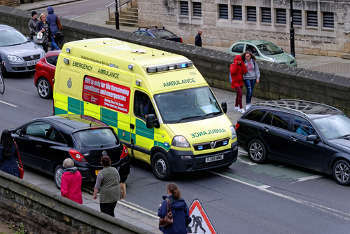 She added: 'Using automatic vehicle location data what we found is that when there is a red light lots of drivers would just stop and would not know that they can go through the light to let the ambulance pass. if you can change the lights to to green you can let people through a lot easier and prevent ambulances having to weave in and out of traffic. 'Ultimately this is about people. If we can save just one life it will have been a success. For the trial we want to use use a GPS tracker on the ambulaunce and in the future we want to handle more variables. Computer modelling in Liverpool indicates that the AI could reduce response times by 40%, but the Oxford trial will be the first live test on the road. It is due to start by the end of the spring and is expected to last a year. Red Ninja has received £220,000 from Innovate UK to help develop the system and is working with partners Dynniq, Siemens, the Transport Systems Catapult and the NHS.